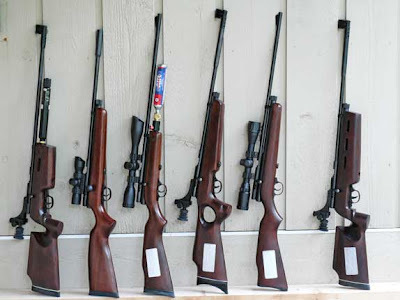 Given the extremely high temperatures across the country, it's probably a good time for us all to remember about valve lock on C02 air rifles and the benefits of shooting in a nice, cool basement right now. The QB78 airgun family - like all other C02-powered air rifles including the Crosman 160 - will suffer from valve lock when the gun reaches a temperature in the region of 90 - 95 degrees F.
Valve lock occurs due to the increased pressure of CO2 in the air rifle due to the effect of temperature. This increased pressure overcomes the strength of the hammer spring and prevents the valve from opening fully. The result is a significant drop in muzzle velocity. It seems like there's a sudden problem with the gun! The good news is that this is a temporary phenomenon and that the gun will return to normal when its temperature drops. There's actually nothing wrong with the gun, it's just a natural result of the physical properties of CO2. New Design Tank Block Kits for QB79 Now Available. Just back in stock today are plentiful new supplies of the QB79 Tank Block Kit. One surprise has been to discover that these latest kits have a new design for the tank block itself. 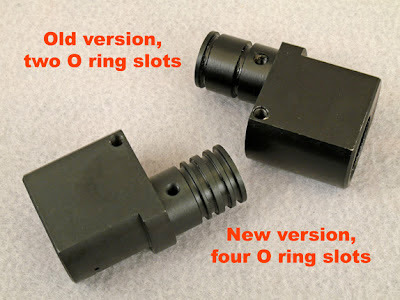 There are now FOUR O ring slots instead of the previous two. It looks like the factory wanted to improve sealing between the Tank Block and Main Tube. There's no other differences in design or functionality that I can detect. Here's a comparison of the old and new versions. 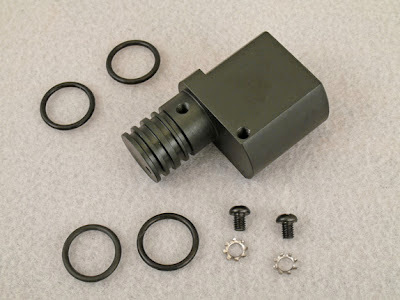 The complete new QB79 Tank Block Kit looks like this. 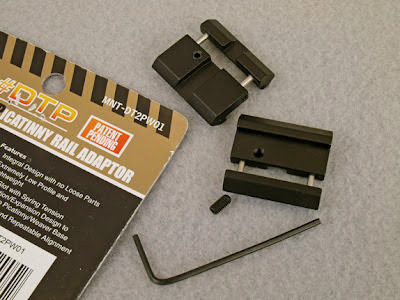 Also back in stock are limited numbers of the sidelever-cocking AR2078B target model, in .177 caliber only. Thanks to all who have waited for these items to become available again! 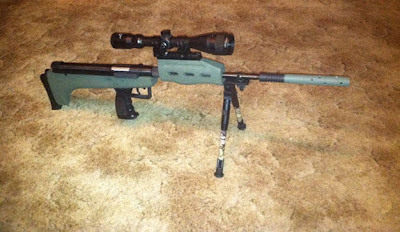 This post was written by Vance Purdy, an Archer Airguns customer. 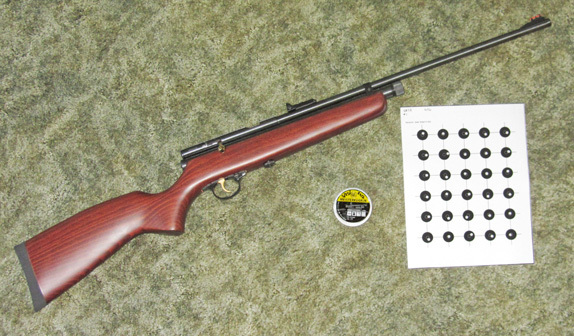 Vance read the QB78 test report that I published on our site some years ago and was inspired to conduct his own tests of a QB78 Deluxe air rifle. In my opinion, Vance's testing is the most comprehensive that I have ever seen and his scientific methodology is clearly outstanding. It's a great test report. Among the highlights is his proof that his QB78 Deluxe has the inherent accuracy to place 120 shots inside the area of a Dime at 10 metres! If only we could all shoot that well!!! 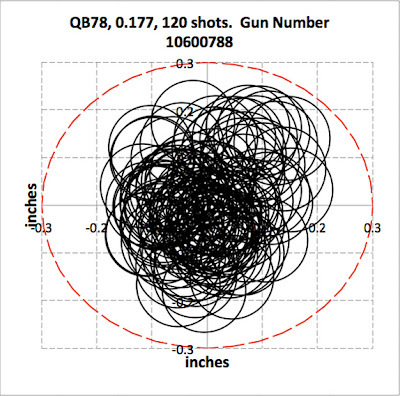 This test is similar to the one entitled "QB78 Airgun Technical Data and Info" except that it uses a new QB78 Deluxe air rifle in 0.177 caliber. 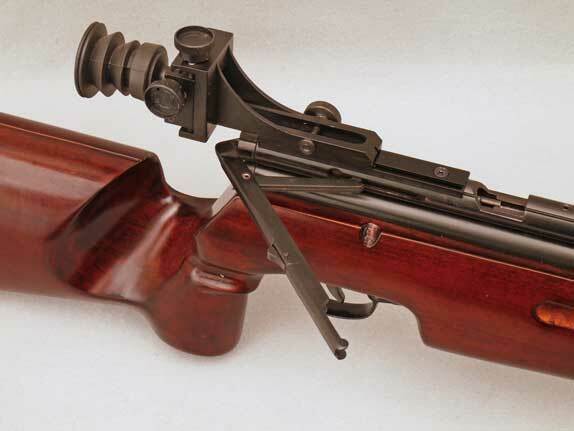 The air rifle is serial number 10600788, with no modifications except an Archer Airguns-installed Hammer Debounce Device ("HDD"). The testing and writeup was done by a customer (& retired engineer) who enjoys doing this sort of thing. 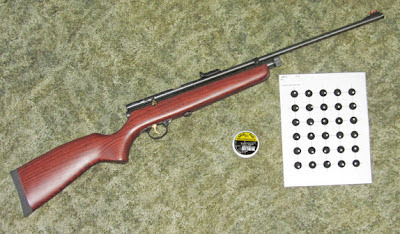 The bottom line is that this recent (May 2012) air rifle performs very much like the older 2002 model. The differences can be attributed to the different aiming method, different caliber, installed HDD, and higher test temperature. 1. The gun was loaded with two fresh "powerlets" and fired for 70 shots using RWS Meisterkugeln 8.24 grain wadcutter pellets. 2. Pellets were used as-is from the tin. No sorting or lubrication. 5. 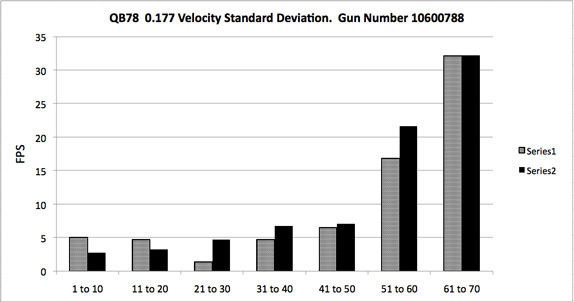 The standard deviation of the velocity, muzzle energy and accuracy were averaged every 10 shots. 6. The test was repeated the next day using a second set of Powerlets. 7. All the data was recorded in a computer spreadsheet and graphed to provide the results you see here. ** shots were aimed using a laser, telescope, and rifle clamping mechanism that allows very fine control over the aiming point. One shot per bullseye was fired, and the POI measured using a computer scanner and OnTarget software. 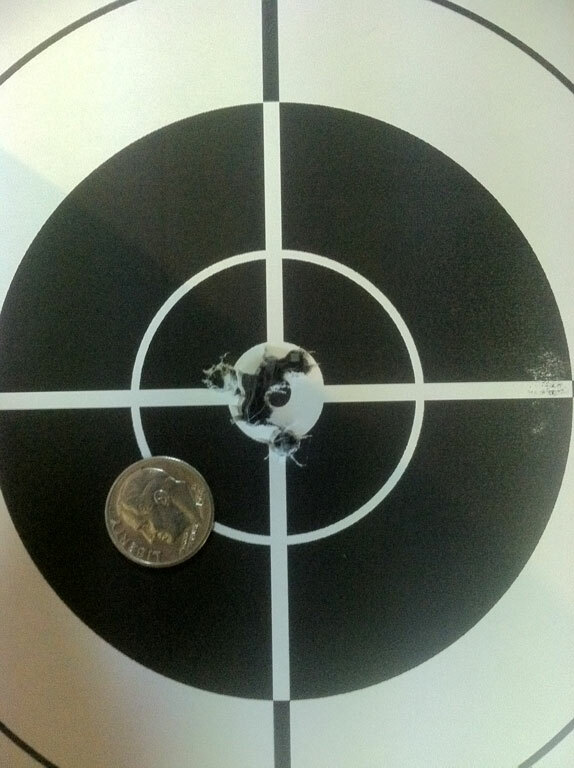 Range is "10 meters", 368 inches from muzzle to target. Indoor / no wind conditions, temperature ~73F. 100% of the shots taken were counted (no "fliers"). The first graph shows the muzzle velocities of every shot. General behavior is very similar to the 0.22 caliber results. Typical value with this ammo and CO2 temperature is ~650 fps. CO2 rifles will suffer more shot to shot inconsistency as the CO2 runs out. If we take the shots in groups of ten and compute the velocity standard deviations, we can plot the results as shown below. Again, the results are very similar to those from the 0.22. Consistency is excellent through shot number 50, then begins to fall off as the CO2 depletes. 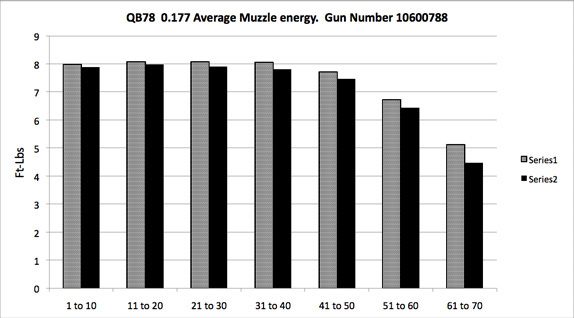 The next graph shows the calculated average muzzle energy for groups of 10 pellets. Muzzle energy is quite consistent through shot 50, then begins to fall off. Note that the energy of this 0.177 QB78 is higher than the 0.22 version: 8 vs. 6.5 ft-lbs. Much of this difference can be attributed to the installed Hammer Debounce Device (HDD), which significantly increases muzzle energy. Also, some of the difference is due to the higher test temperature used for the 0.177 rifle here. The graph below measures accuracy in the same manner as the 0.22. The value is the center-to-center group size for each group of 10 shots, expressed by adding together the vertical c-t-c span and horizontal c-t-c span measurements. Once again, the result is very similar to the 0.22, in that each ten shot group stays tight through shot number 60, and then degrades. The typical value for this 0.177 rifle is about 0.4 inches, and for the 0.22 rifle the typical value was about 1.5 inches. However, this large difference is NOT what it looks like. The testing on the 0.22 rifle was done using open sights, and shows the results a typical marksman might expect. The testing on the 0.177 rifle used a laser, telescope, and clamping platform so that each shot was extraordinarily well aimed when released. 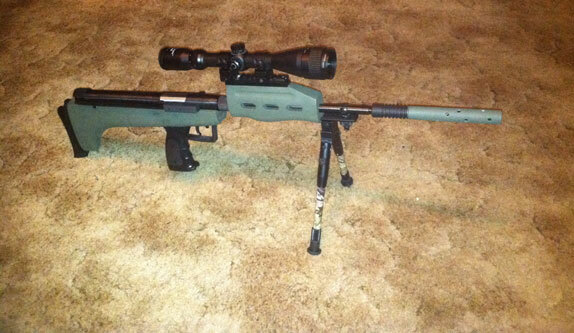 The 0.177 accuracy measurement is more like the ultimate capability of the rifle itself. Few real world shooters would get this result under normal shooting conditions. The graph below shows the virtual group -- 120 shots, all shown as if fired at the same target. (Note that this chart should be circular, it became squashed in rendering for the web - Stephen Archer). It is interesting to see how the muzzle velocity changes the vertical point of impact. The graph below shows where the pellets hit, in the vertical direction, plotted against the muzzle velocity. The "tail" on the left side is from shots taken as the CO2 pressure runs out. The dashed line is theory, assuming the pellet drops due to gravity only, with no aero effects. The pellet will hit about one pellet diameter lower when the velocity drops from the initial 650 fps down to ~550 fps. This happens around shot number 60. If we get even more precise, and demand only half a pellet diameter drop, we would use 600 fps as the cutoff. This happens around shot number 55. Vance, thank you. All I can say is "WOW" for the efforts you have taken and your generosity in sharing these results with the airgunning community. Your testing clearly shows the excellent accuracy of which the QB78 Deluxe is capable! So How Can I Tell if the XMV Tune Kit Will Benefit My Ruger Air Hawk? One of the great things about the Archer Airguns XMV Tune Kit is that it’s so easy to tell if your individual gun will benefit from it. 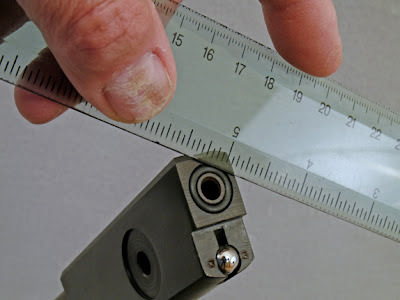 All that’s necessary is to drag a ruler across the rear of the barrel, just as shown in this photograph. Carefully feel what happens as the ruler passes over the breech seal area. Note that the barrel has been removed from the gun for clarity in these two photographs. 1. 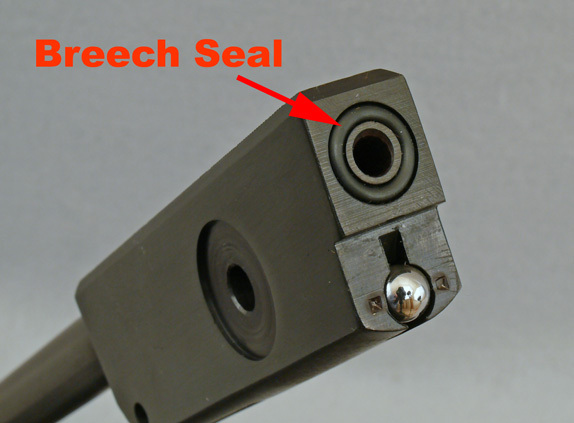 If there’s no resistance at all to the ruler from the breech seal, this indicates that the breech seal is NOT projecting from the barrel and is thus providing no sealing effect at all. This is the “maximum benefit case” where the XMV Tune Kit will give a huge benefit to muzzle velocity - 80fps or more. 2. If the rules just catches, or drags slightly, on the breech seal, then there’s some loss of air when shooting and the muzzle velocity definitely will be increased by installing the kit. The increase will be about 50 - 60fps. 3. If you feel a definite bump with the ruler, you’re one of the lucky few whose gun already has good sealing. But even here, replacing the factory breech seal with the superior quality part supplied in the XMV Tune Kit will give an increase of around 40fps. So, it’s really just a question of “How much muzzle velocity do I gain?” when installing the Archer Airguns XMV Tune Kit for Ruger Air Hawk and Blackhawk. SAFETY NOTE: Although it’s easy to test breech seal projection with a ruler, I strongly recommend making this a two person task. 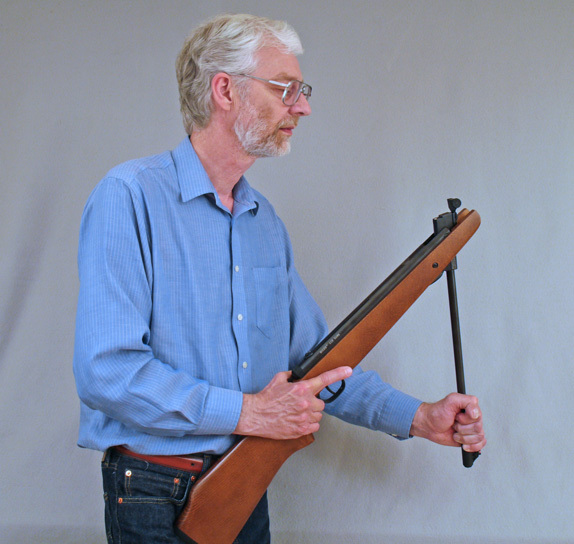 One person should hold the barrel firmly with the buttstock braced against the body and no finger anywhere near the trigger - as shown in the photograph. Do not release your grasp of the barrel at any time when making this test! Then a second person can use the ruler. Obviously the gun will have been cocked for the test, so carefully load a pellet and fire safely at a target after testing. We recently received the following from Chris Norling, who provided his approval for us to publish his opinions on the QB57 Deluxe air rifle he purchased from Archer Airguns. These are his words and photos. Thank you, Chris, the gun looks excellent and - by the way - that's great shooting: a Dime-size group at 25 yards! I received the QB57 Deluxe last Saturday (exceptional delivery time by the way). Out of the box it performed better than expected but having owned several Chinese Firearms I knew there would be room for improvement. I tore it down completely; giving it a thorough cleaning & inspection- addressing any machining marks, rough edges, etc. Reassembled with new 12.9 screws (w/ blue loctite) & Greased with Wurth True Glide. Next, I addressed the wood stock and forearm sanding out imperfections and painted both pieces along with a DIY muzzle brake olive drab. Final step was joining a Picatinny rail to the stock 11mm rail and mounting a CenterPoint Mil-dot. Looks good, How does it shoot? Out of the box it was good but with a little work it’s become quite an amazing little shooter. Thank you for making these available to US customers at such a reasonable price and outstanding service!